Sound Affects PremierNewsBlackstar release new Insider software update for free! Blackstar release new Insider software update for free! Do you own a Blackstar ID:Series or ID:Core amplifier? If so you will want to update your Insider software for free and get all of the new features. Blackstar have released the latest FREE Insider Software update (v1.6.0) which is available now for ID:Series and ID:Core programmable amplifiers delivering more pro features. So if you own a ID:Series or ID:Core amplifier, update your software today! Full details and download can be found here! Add in your effects via the Insider software. Use the controls to fine tune exactly how much of each effect you want. 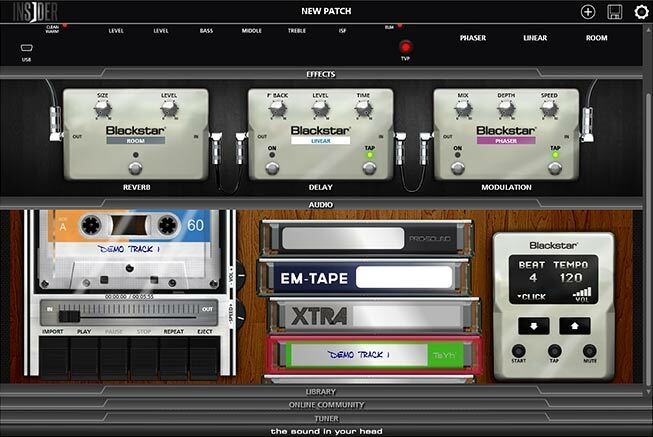 Jam along to your favourite backing tracks using the built in audio section. Speed up or slow down thee tracks to practice. Finding your guitar out of tune? Then open up the in-built chromatic tuner and use this to get your guitar back in tune.